From LewRockwell.com, a transcript of Hoppe’s speech The Economics of World Government (The Lew Rockwell Show #130, 18 Aug. 2009) (from Mises University 2009). ANNOUNCER: This is the Lew Rockwell Show. ROCKWELL: Recently, at the 2009 Mises University, Professor Hans-Hermann Hoppe talked about the economics of political centralization. What is it that brings about unification, unfortunate unification and centralization within a country like the United States where the states gradually become irrelevant under an all-powerful D.C., and, for that matter, drives countries to join together into an even worse situation, of course, a world government? HOPPE: OK, I will begin my lecture. Because there is a scarcity in the world, we can have conflicts regarding these scarce resources. And because conflicts can exist whenever and wherever there exists scarcity, we do need norms to regulate human life. Norms – the purpose of norms is to avoid conflicts. And in order to avoid conflicts regarding scarce resources, we need rules of exclusive ownership of such scarce resources or, to say exactly the same, we need property rights to determine who is entitled to control what and who is not entitled to control what. These rules, I have defended in my previous lecture, the rules that Austrians regard as rules capable of doing this, avoiding conflict and, at the same time, being just rules are the following. One is every person owns himself, his own physical body. He has exclusive control over his own physical body. The second rule refers to, how do we acquire property, the right of exclusive control of scarce resources outside of our body in the external world. Previously – initially, the outside world is un-owned and we acquire property in objects outside of our body by being the first one to put certain resources to use and, thereby, we become the owner. This is also sometimes referred to as original appropriation or as homesteading. Rule number three and four are implied in the previous two. He who uses his physical body and those things that he originally appropriates in order to produce something, to transform things into a more valuable state of affairs, thereby, becomes the owner of what he has produced. Producer owns the product. And finally, we can also acquire property by a voluntary transfer from a previous owner to a later owner. In addition, you also realize that if you would follow these rules, by and large, wealth will be maximized. And if we follow these rules, then all conflicts can conceivably be avoided.We again only emphasize in this lecture that there are intuitively sensible rules, who should own us unless – who should own us, except ourselves. Somebody else should own us sounds absurd. Should the second one be the owner who has done nothing to a resource, instead of the first one? Again, that sounds absurd. The producer does not own the product, but somebody who has not produced it should own the product? Again, that sounds absurd. And obviously, rule number four, if it would be possible to just to take something away from other people against their consent, civilization would be destroyed in a moment’s time. Now the question is, there are, of course, people who just say, so what. Even if we can justify them and show that they are economically beneficial to follow and that all conflicts can be avoided if people were to follow these rules, there will be law breakers. There will be criminals, evil people as long as mankind exists. What do we do with these people? How do we enforce these rules? Merely stating them does not mean that people will actually act according to them under all circumstances. There will always be bad people. The classical liberals gave the following answer to the question, how do we enforce these rules. They said this is the sole task of government, the sole task of a state. A state doesn’t do anything else except to make sure that everyone who breaks these laws will be hit on the head and brought to their senses. Now what do we have to make to this answer of the classical liberals? It includes in this case, also, Ludwig von Mises. And Ludwig von Mises’ position was precisely these rules are the rules of a just society and it is the task of the state to see to it that people adhere to these rules and punish – and threaten to punish potential lawbreakers. Now, whether this answer is right or wrong, that is, whether this is the task of the state and the state will do it efficiently, that depends, of course, on what is the definition of a state. And I’m not giving you a fanciful definition of the state but that definition that is more or less accepted by everyone who has ever written about the state. It is the standard definition of the state. And that is, the state is a territorial monopolist of ultimate decision making or of ultimate arbitration in some territory. That is, whenever there is a conflict arising, the state is the ultimate arbiter to decide who is right and who is wrong. There is no appeal beyond the state. His is the final word; you are right, you are wrong. And this implies also that the state is the final arbiter, the final judge, the final decision maker even in cases of conflict involving the state or state agents themselves. We will see in a moment that this is a very important implication of what a state is, and from that, lots of consequences follow. A corollary of this is the state is then also the only agency that is permitted to tax people, to unilaterally determine the price that we must pay for doing this service to us, that is, enforcing these rules. Now, given this definition of the state, I want to show that it is an illusion to believe that the state will be successful in doing what, according to the classical liberals, is his sole and only task, mainly to enforce these rules. The first argument against this position of a minimal state is to say, look, in economics, we always say monopoly is bad from the point of view of consumers, and competition is good from the point of view of consumers. Emphasis, “from the point of consumers.” From the point of view of a producer, a monopoly is always great and competition is always terrible. But from the point of view of consumers, competition is good and monopoly, bad, for a simple reason that whenever we have a monopoly, the price of the product will be higher than it otherwise would be and the quality of the product will be lower than it otherwise would be because he is shielded from competition by other people entering the market by offering lower prices or offering a higher-quality product. If we have free competition, then there is a constant attempt of producers to produce at the lowest possible production costs, pass this on in the form of lower prices to consumers, and to produce the highest quality product. Otherwise he will simply lose out in competition against others. Otherwise, he will invite, so to speak, competition against himself. So the first argument would be simply, why should this also not be also true for providing the service of protecting our private property? Why should a monopoly be, in this area, good, whereas, in all other areas, we say monopoly is bad? Not only this, when it comes to, say, a monopoly of milk production, then all we can say is, yes, a monopolist of milk production will offer a comparatively lousy product at comparatively high prices. So we get a lousy product in a way. But when it comes to a monopoly of law and order, of ultimate decision making, the situation is actually far worse. Not only can they produce, so to speak, a lousy good, what a monopolist of ultimate decision making can produce is they can produce bads in the following way. Look, if I am the ultimate decision maker in any state of every conflict that might arise, what can I do? What I can do is I can cause conflict myself and then be the arbitrator in my own case. I can then determine who is right and wrong. And if I have caused the conflict myself, then it is, of course, easy to predict what a monopolist will, by and large, decide. He will decide, I was entirely justified in doing what I did to this complaining party, and I’m right. A policeman hits you on the head, you complain about this fact. Who then decides who was right and wrong? Maybe not the policeman directly, but another person who is employed by exactly the same agency that employs the policeman also. So what you can predict in this situation is you will, instead of having a situation where peaceful cooperation between various individuals exists, you can predict that there will be constantly conflicts generated on the part of those people supposedly protecting our lives and property. And then a decision will be made that favors them over those people that have been aggressed upon by the state agents themselves. And to make matters worse, then they can also decide what you have to pay them for this type of justice that is committed onto you. That is, first, they hit you on the head, then they decide that it was entirely justified; you looked the wrong way or whatever it was. And then they tell you, and for this service, please pay me $100, and you cannot say no. Otherwise, we will jail you. Again, this follows, so to speak, automatically from what the definition of a state is, a conflict arbitrator even in cases where you have yourself generated the conflict. And on top of it, the standard anti-monopoly arguments apply, of course, as well. There will be a constant tendency for the quality of justice to deteriorate and, parallel to this, a constant tendency for the price of this ever-lower quality of justice to go up. You must pay more and more and more for getting less and less and less in terms of justice. So an entirely failed argument as far as I can see in defense of a minimal state. The idea of a minimal state is some sort of absurdity. Next point, on top of this, the classical liberals made another fateful error, the defenders of minimal states. When the classical liberals developed their program, and they saw in front of them states that were, by and large, monarchial states, kings and queens and so forth, and classical liberals now made a fateful error. They said monarchial states are bad institutions for the reason that monarchs, kings or queens, have privileges. Kings and queens are, so to speak, a violation of the principle of equality before the law. The king can do certain things that other people simply cannot do and we must institute a society where equality before the law is in effect. And what solution did they propose? They proposed as a solution, democracy. Again, not all classical liberals, but most of them did this. And they said democracy is somehow compatible with the idea of equality before the law, because everybody can now become king or queen or senator or prime minister, instead of just a hereditary class of individuals. Now, I want to show, first, that this is, again, a fateful error to believe that democracy implies equality before the law. All that, in fact, happens by substituting democracy for monarchy is that we replace personal privileges with functional privileges. In democracy, our democratic rulers also have privileges as compared with what normal citizens have. I’ll give you just an example. And this privilege is reflected, so to speak, in the fact that we have a separation or a distinction between, on the one hand, what is called public law that covers the relationship between the rulers, the democratic rulers and the citizenry and, on the other hand, private law that covers the relationships between private citizens. Under public law, that is, if you are a public official, you can do things that, under private law, you can never do. If I steal your money from your wallet, I will be punished as a private citizen. If I, however, do this as an IRS agent, this is not considered to be a crime, even though from the point of view of the person who is being robbed there is absolutely no difference whatsoever. Public law allows stealing. – then this sort of thing is just called – you are compelled to engage in public service. If I take your money and give it to somebody else as a private citizen, this is called stealing and fencing of stolen goods. If I do that as a public official, it’s called social policy. – medal for this sort of thing. It is not their own money that they give away. So it is fencing of stolen of goods. As a matter of fact, we might even say what states do is even worse than what private criminals do, in so far as private criminals, at least when they are done with their bad stuff, at least they disappear. Next time, you can prepare yourself for such an attack and maybe smash them when they come again. Whereas, states do that on an institutional basis. They rob you and then, the next week, all over. So it is an error to believe that under democracy you have, so to speak, equality before the law. Only functional privileges take the place of personal privileges, but there exists privileges just as much as under monarchy. The situation is even worse than this. If you look at the transition between – a transition from monarchy to democracy, where everybody can reach any type of position in the government and no hereditary privileges exist, what takes place here is that we replace someone who regards the country as his own private property by someone who is a temporary caretaker of a country. And this has dramatic effects. In order to illustrate this, just image for a second, I give you a house one time. I make you the owner of the house. You can now pass it own to your sons or your daughters or whatever, and you can sell it in the market and keep the money from the sale for yourself. In the other case, I give you the house and say for five years or four years you have exclusive control over this house, but you do not own the house, you cannot determine who will be the successor, nor can you sell the house in the market and keep the money yourself from the sale, but you can try to maximize your own income from using the house for four or five years. Will that make a difference in terms of how you treat the house? And the answer is, of course, it will make a drastic difference. In the one case, you will be interested in preserving the value of your property. You will not try – if you are the owner, you will not try to just run down the house very quickly. After all, if you would do this, you would get less in the market. The price of the house would fall. Or you might be interested in giving something that is decently valuable still in the future to the next generation. On the other hand, if you are just a temporary caretaker, what is your incentive then? Then your incentive is I want to maximize whatever I can get out of the house within four or five years, regardless of what happens to the capital value embodied in the house. Even if the house is then in ruins, so to speak, at least you had four or five glorious, glorious years. You could make all sorts of friends with your rental income that you received. You can put, whatever, 20, 30 people in the house, each paying rent. The wallpaper is falling off after a while, the toilets are plugged, the plumbing does not work anymore, the carpets are ruined and so forth, but what would you care? After all, you don’t have to just – it is not you who has to pay the price for this behavior on your part in the form of the lower prices that you would get for the house. After all, you don’t own it. You don’t own the place. So what you see here, this is, so to speak, the difference between monarchy and democracy on a large scale. The monarch has the long-run perspective. By and large, he wants to preserve the value of his realm in order to pass something valuable on to the next generation. A democratic politician, because he knows I am only in power for a few years, his incentive is I have to milk the cow as quickly as possible and then run away from it, whatever the consequences are. Politicians, democratic politicians are precisely short sighted. Monarchs are far-sighted individuals, comparatively speaking, so to speak. So there is an additional error in believing democracy to be an advantageous form of social organization. I want to also give you a third argument against democracy that somehow speaks favorably of monarchy. And this is, when people say, look, aren’t you always in favor of open entry, and don’t we have to embrace democracy because there’s open entry into positions, there’s competition going on, whereas, otherwise, if we have hereditary rulers, there’s not open entry, there’s no competition? Now, the argument, as it goes, is perfectly correct, except it applies only to the production of goods. That is, you do want to have competition in the area of producing things that are regarded as goods by people. But you do not want to have competition in the area where it concerns the production of bads. But it is production of bads if you can cause conflict and then decide in your own favor. It is a production of bads if you tax people; tell them you have no choice, you cannot deny my right to tax you; tell you what you have to pay for my services. In the production of bads, it is good to have no competition. Only in the production of goods, we want to have competition. We do not want to have competition in who is the best one in beating up other people, who is the best one in running a concentration camp. There, we are happy if we have incompetence running the whole show. – taxing us and causing conflicts. So the argument was, open entry does work exactly the other way around as soon as we consider precisely what states do as compared to what the producer of genuine goods demanded by consumers – consumers want. And we have a few considerations here. Look, a king comes into power by accident of birth. Now, this does not prevent that the king can be a bad guy. If he is a bad guy, however, there is usually a dynasty; that is, a family of which he is a member. If he is a bad guy and ruins the country, his family members will be very much concerned that they might loose power over this type of behavior. And what they frequently do then is to surround this bad guy by people who keep him in check. And if this does not work, they frequently resort to the means of simply having somebody kill the guy off, which, of course, would be a good thing to do. – who just cares about his people and so forth. You cannot rule out that he might be actually a nice man. After all, these people are educated in such a way. They are prepared for such a position. And more often than not, they are decent individuals. Now ask yourself what happens under democracy where we have competition for this type of field. First of all, you realize that if you have bad democratic rulers, the likelihood that these people will be killed is comparatively low. Why is it low? Because people all say, OK, it’s only for four years and then, of course, a really good guy from my party will come to rule the place. And there is then a certain hesitation to kill the guy off because all you say is, we have to wait four years and then things will be better. So less numbers of killing of rulers, and I think this is a bad thing. Secondly, now ask yourself, can a good guy ever rise to the top in a democracy. That is, can a guy who says, I will not tax the rich in order to give to the poor, I will strictly enforce private property rights, rich people are not bad people and poor people are not good people, I will do absolutely nothing, I will adhere to a laissez-faire policy, can a person like this ever rise to the very top of government? And I’m telling you that is absolutely impossible. Try to run a campaign on these sorts of things. Maybe you can win in some small district, maybe you can win if that election would be in a small village where everybody knows everybody else, but you can certainly not do this in a society with millions of people where each has the temptation, of course, to rob people, through the vote, of their property and personally benefit from these robbing exercises. So even on that count, again, I think monarchies are clearly superior. I’m not defending monarchies. Now, I come to what then is the correct answer to the initial question, how do we enforce these types of laws. And the correct answer is we have to abolish monopoly. That is, this task must also be taken on by individuals or agencies that adhere to exactly the same principles as everybody else. Only then do we have, of course, equality before the law. That is, those institutions, those individuals that provide this specific service of protecting our lives and our property must themselves adhere to exactly the same rules that we require other people to adhere to. And we call this a pure private-law society, a society where only private law exists. The distinction between public law, on the one hand, and private law, on the other hand, simply disappears. Now, how would a society such as this work? First, this implies, of course, that every person is perfectly free to engage in self defense. I’ll merely say something more about this. It should be clear that just as, in a complex society, we do not make our own shoes or sew our own suits or cut on our own hair, but rely on the division of labor, in a complex society, we’ll also rely on the division of labor when it comes to this specific task. But nonetheless, it should be emphasized from the outset that, yes, of course, each individual has the absolute right to engage in self defense against people who aggress against his private property rights. And there should be no doubt in your mind that this is a very effective means to achieve this goal. We do know, for instance, that in the Wild West, when the power of the federal government did not really extend to all the corners of the country that – and when almost all people were heavily armed that the crime rate was actually significantly lower than it currently is. In the Wild West movies, sometimes you get a different impression, but that is entirely a mistake. Many studies have been done on this. Before you get out of the bank, you will be a dead man. – and then one or both lie dead on the street. This is not a crime. This is, after all, something that – just like a boxing fight. That two people just decide that they want to engage in this sort of stuff. Nobody except these two people have to worry about this. If you abstained from going to bars and getting drunk, you were pretty safe in the Wild West. A very important book in this area has been written by John Lott, More Guns, Less Crime. He gives a huge amount of empirical data showing that, of course, if people are free to defend themselves that crime rates tend to go down. But as I said, in a complex society, this is only a small part, a small contribution to defending ourselves. We will rely on specialized agents and agencies to provide us with this service. And a particularly important role in all of this would likely be played by insurance agencies. And I want to illustrate, in what regard a society where this service would be provided by competing insurance agencies. And again, do not think of insurance agencies as they exist nowadays. The insurance industry is one of the most heavily regulated industries at the current moment. But think of insurance companies really freely having to compete in the market for customers willing to pay them for their service and being permitted to change their provider of security services if they are dissatisfied with what their particular agency is doing for them. So what can we expect, in such a situation where we have competing defense insurance agencies and so forth providing us with these services? The first thing that we can expect is that, as in all areas where we have free competition, prices will tend to fall and the quality of the product will tend to increase, as it is the case in any other area also. Whereas, if we have the monopolists doing it, we have predictably dependency of prices will be higher than they otherwise would be, and the quality of the product will be lower than it otherwise would be. The second thing, in such a situation, we can avoid over and under-production of security. How many resources should be committed to beer production, to milk production, to car production? In the market, it is consumers who decide how many resources are committed to this purpose or to that purpose. Consumers make certain firms grow or make then shrink or ultimately disappear from the market. If you have a monopolist providing this service, nobody can go into competition against it. They can force you how much you have to pay for them. What will be their answers, how many resources should be permitted to this specific purpose? And the answer is the more resources we can permit to this, the better off we, as the producer of this particular service, are. Should there be one policeman or should there be 10 policemen or 1000 policemen? Should the policemen have just a stick or should they have a machine gun? Should they have tanks to provide this type of service? You can imagine that almost all resources in a society are used to protect you, but you have hardly anything left over to eat. – who feels capable that he can do it on his own or with a few bodyguards. So this problem would be automatically solved if we would have free competition in the area of security. You get as much as you want. You can increase it, decrease it, but it is not some other entity that tells you, this is how much I say you need. And they, of course, always think that more is better. That doesn’t mean that they provide more services, but the expenses that they have available to themselves are higher and higher. Then, next advantage – victimless crimes. You know that currently a huge amount of recourses are committed to combating victimless crimes, in particular, of course, the entire war on drugs. There are millions of people in the United States locked up because they have just done nothing else but, whatever, smoked dope or take cocaine or whatever it is, without having committed any crime that has a victim that you can point. Can you image that an insurance company that would insure you or protect you against victimless crimes would obviously charge a higher price than an agency that abstained from offering such a service? It is easy to predict that, of course, most people, because they are not affected by victimless crimes because, after all, they are not victimized by it, would say, I don’t want to shell out extra money because there is a prostitute somewhere having a client in some place, and to crack down on them, of course, requires extra resources. After all, I’m not involved in any activity such as that. I only want to be protected in my own home and with my own property. So companies that would offer these types of services would likely go out of business instantly. Currently, as I said, a huge amount of resources is wasted in things like this, going after victimless crimes. – and I really failed in my obligation towards you, and because of this, here you have a compensation. And because insurance companies would have indemnified you in case – imagine you go to an insurance company and say, OK, this is the premium, OK, I pay my premium. And then you say, so what if something happens to me? And then they say, well, tough luck. You can immediately see that no insurance company would get off the ground if they would have this type of attitude. People want to have three things in particular. Prevention? How about prevention? What is the incentive of a tax-funded policeman to be good at preventing crime? The answer is virtually zero. His salary does not depend on whether he is good at preventing or not preventing. As a matter of fact, preventing crime might be somewhat dangerous to do. It’s better to go out, hand out parking tickets, speeders, and these types of people. The danger is relatively low that you get shot by doing this sort of thing. Why would insurance companies be good at prevention? The answer is, whatever they can prevent, they do not have to pay up. That is, it is an element of reducing the cost of operation for them, so they tend to be better at it. What’s the next thing that people would want? The next thing that people would want is that, of course, whatever has been stolen or broken or whatever, is recovered. Now, how likely is it, if somebody steals something in your house, your car or your stereo, that the police will actually find this sort of thing? The answer is, you can forget about it. They will find practically nothing except by accident. On the other hand, what is the incentive of insurance detectives, so to speak? The incentive is, of course, I try to find it as best I can, because whatever I find, I do not have to compensate the victim for it. An example, I had some friends whose V.W. got stolen in Italy. So he went to the Italian police and reported, my car has been stolen, and then the police wrote it down. And he said, now what will you do. And they said, we will file it away. So then he went to his German insurance company and said, my car has been stolen. The insurance detective was a German guy and the car was stolen in Italy. The insurance detective found it after three days. Yes, there was major damage to the car and so forth, but, nonetheless, there was a recovery of the object for an obvious reason: This is in the financial interest in such as agency to do this. There is no financial incentive on the part of monopolized police forces to do anything remotely similar. Last thing that we want is, of course, that we have to catch the guy and we have to punish the guy. Now, an insurance company would, of course, have an incentive to get the guy and then force the guy to make compensation to the victim; again, in order to reduce their own cost of operation. Now, what is what the state currently does? First of all, they hardly ever find them except for capital crimes. And if they do find them, what will they do? Does the victim of the crime ever receive compensation? The answer is, I have not heard of cases such as that. So you don’t get compensation. – when they get out. They can even study law, as far as I know, so that they know next time better to defend themselves against. Next point, insurance companies would definitely not ask you to disarm yourself. Imagine you would go to an insurance company – I want you to protect me, and what is the premium and stuff like this. And then they would say, yes, but in order to be better able to protect you, first, we must make sure that you hand over all types of weapons to me. – everything has to be handed over to me, then we can protect you better. If they would ask something like this, you would immediately know there is something fishy going on. – sickles, anything like this, not to speak of revolvers and machine guns at home, because then I can freely enter your premises. I am the only one who has all the weapons and it is easy for me to engage in my beloved activity that I do. – if it were the case that I was the one who initiated the whole thing. That is, they want to avoid conflicts. And in order to avoid conflicts, every client that is accepted by a company will be forced, will be compelled to adhere to, “You have to behave in a non-provocative way. Only then will, of course, we provide you with these services. But if you behave like a wild beast, we will not accept you as a client.” As a matter of fact, there will be lists out of people, lists of people that will not be insured because they are considered to be too high a risk. And if they have no insurance, life is very dangerous. So vigilante justice would also, by and large, disappear because vigilante justice, of course, is, again, expensive. If you immediately engage in retaliation or so, that is a costly thing for insurance companies. Only if the immediate attacks are done upon you, would you be permitted, so to speak, to defend yourself. If the thing is already over and you know who the guy is and immediately go after him and then, as retaliation from his family and all the rest of them, all of this would, by and large, disappear instantly in a free market of security provision. And most importantly, there would be contracts that you are offered. Look, currently, we have no contract with the state whatsoever; they say, we protect you. But do we have anything that we can refer to, what will happen in what type of case in what situation? And the answer is not at all. Again, go to an insurance company, and they say, this is the premium that we charge. And then you ask them, what will you offer in return. They say, I don’t know, that depends on the circumstances. You will be offered a contract, and the contract, providing, so to speak, for various contingencies, what will happen in such and such a situation. And, of course, the contract cannot be changed. That is, the insurance company cannot say, look, we offer you this contract but we reserve the right on our part to unilaterally change the contract as we go along. This is precisely, however, what states do. States constantly change laws, make something that was yesterday still legal, tomorrow, it is illegal, and vice versa. So constantly, the rules are changed. No contract offered by insurance companies would ever stipulate, we can unilaterally change the rules, declare this to be legal and that to be illegal and, tomorrow, we change our mind and redefine matters. And the fact that contracts would be offered has now the following additional advantages. We can imagine three scenarios. We can imagine that two individuals have a conflict with each other that are protected by the same agency, by the same insurance agency. Everybody knows that such a case can arise, that I have a conflict with somebody who is a client of the same company. Obviously, knowing this, every company would, in its contracts, have a stipulation, what will happen in such a case if one of my guys has a conflict with another one of my guys. And then they describe, so to speak, the procedure that will be set in motion. Both clients agree to this procedure from the outset and it will then afterwards simply be enforced. Just like there’s an end to it just like it is now. The second case that we can have is I have a conflict with somebody else who is insured by a different company than I am myself. Again, every company would for its own clients offer a contract that has a stipulation, what will happen in such a case, because everybody knows that can, of course, happen, that I have a conflict with somebody else insured by some one else. So again, there are clauses in the contract saying what will happen in such a case. If these two insurance companies then come to the same conclusion, I’m the guilty one or you are the guilty one, again, there is no problem. And whatever they decide, they come to a unanimous agreement. There might be hearings and all this. Again, exactly stipulated what will happen. Then this will be, again, enforced. No problem. Now we come to the most complicated but, in a way, the most interesting case. So what would happen in the case that two people are insured with a different company, have a conflict and they come to different judgments? That is, my company says I’m right, and your company says I’m right; my client is in the right. Well, they then shoot it out. Again, everybody knows, of course, that such a situation can arise and, again, each company will have an incentive, so to speak, to say exactly what will happen in this case. We do not agree who is right and who is wrong, what do we do in this case? Now, would the company then say, OK, in that case, one company decides, has the ultimate say, and the other company will be overruled? No company would offer any contract like this. Nobody would want to be insured with a company that comes out always as a loser. No. In this case, what they would do is they would appeal to independent third parties. That is, to arbitration agencies that also compete on the market, who offer precisely this service, who are neither, so to speak, part of Company A, nor part of Company B, but an entirely independent party. They would now take on this type of case. And there might be different layers of this, but what would be the incentive of such an independent third-party arbitrator, what would be the financial incentive for them to do? The answer is no independent third-party arbitration agency has a guarantee that they will be called upon again in the next instance. In order to stay in business, what they must do is they must come up with a judgment that is considered to be a fair judgment by both insurance companies and, by implication, also by the clients of both insurance companies. And this means, of course, that what the judgment will be is a judgment that does, indeed, incorporate, so to speak, the highest possible degree of consensus on principles of justice. To illustrate this a little bit more, we can imagine, for instance, that we have agencies that adhere internally to Canonical law or to Mosaic Law or to Islamic law or whatever it is. This refers only to people who are both members of this group. Now, what happens if there’s a conflict between, whatever, Christian and somebody who is insured by a Muslim – an Islamic organization, or somebody who is Canonical law as compared to Mosaic Law? The answer is, of course, that the arbitration agencies that deal with such cases then must come up with principles of justice that are generally universal; that is, that are so general that all of these, in their internal law code, different agencies and clients could possibly agree to. So we would have a larger variety of law, plus a constant tendency to work out a universal legal – universal law code. And this universal law code would most likely be precisely this type of law code as the greatest common denominator of all different legal systems that might exist. I should mention, you know, when I end, that when it comes to international relationships, there is already something like this to a certain extent. What, for instance, if a Canadian has a conflict with an American? Realize that sometimes Canadians and Americans can live very close together? It’s just across the street, so to speak. Or a conflict between a Swiss and a German? Just one street separates these two people. There is no monopoly judge in this case. That is, these people, the German and the Swiss, the Canadian and the American live in a state of anarchy vis’ a vis’ each other. The first observation, is there more conflict between Canadians and Americans living in close proximity to each other than there is conflict between Americans, two Americans living in close proximity to each other? I’m not aware of it. Is there more conflict between Swiss citizens and German citizens who live in close proximity to each other than there is between Swiss people, two Swiss guys living in close proximity, or two German guys? I’m not aware of this. What do they – what happens in this case? The Swiss goes to the Swiss Court. The German goes to the German court. If they agree, no problem. If they don’t agree, again, arbitration will set in in this case. And this arbitration in the current system is, of course, also semi-state arbitration courts because, after all, even these supranational courts are, again, manned by people that this state or that state sends into these courts. But nonetheless, you can see that, at least as far as the frequency and smoothness of operations is concerned, the fact that there is no monopoly judge does not cause any problems whatsoever. And what I’m proposing, the same sort of thing could, of course, work also within any given country. With this, I’ll stop and let you think about it. ANNOUNCER: You’ve been listening to the Lew Rockwell Show, produced by LewRockwell.com, the best-read Libertarian web site in the world. Thanks for listening. ROCKWELL: Well, thanks so much for listening to the Lew Rockwell Show today. Take a look at all the podcasts. There have been hundreds of them.There’s a link on the upper right-hand corner of the LRC front page. Thank you. 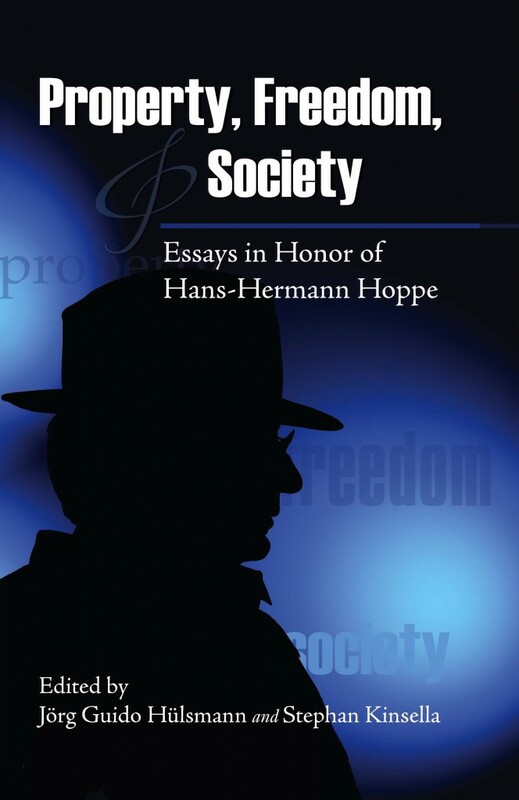 Hans-Hermann Hoppe [send him mail] is distinguished fellow at the Ludwig von Mises Institute and founder and president of the Property and Freedom Society. His books include Democracy: The God That Failed and The Myth of National Defense. Visit his website. Copyright © 2013 by LewRockwell.com. Permission to reprint in whole or in part is gladly granted, provided full credit is given.